It’s baby’s first Christmas but what do you buy? There is a plethora of gift choices for newborns – choose from something sentimental marking the occasion, a toy to play with when they start to spend less time sleeping or maybe go the practical route with something that can be used every day? Click through to see our top suggestions! The first Christmas is always a special one and what little princess wouldn’t love a special outfit to wear on the day? 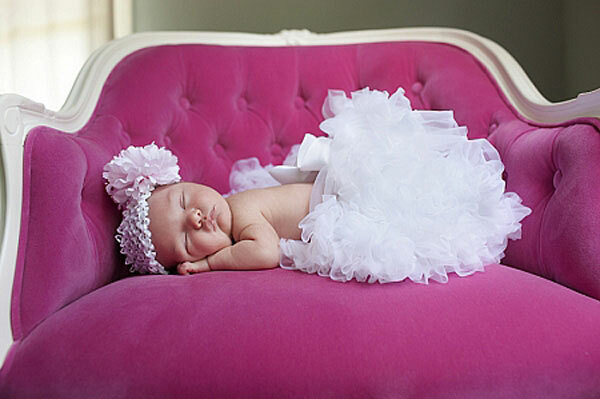 The majestic Oopsy Daisy Baby Newborn Pettiskirt (pictured top, $58.50) will have the littlest girls dressed to impress in layers of soft ruffles and certainly makes for stunning Christmas photos. Available in time for Christmas from Nelly Jean. It’s a given that all little girls must have their own doll, so why not make it one that’s suitable right from birth. 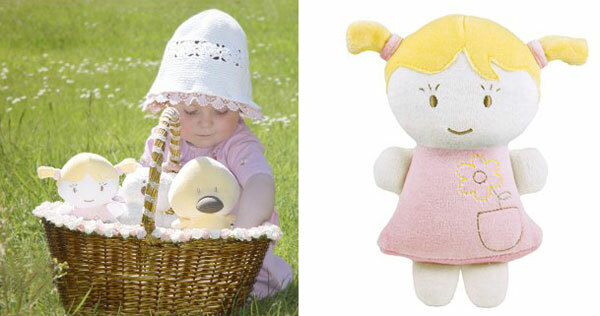 This Dandelion Organic Pink Doll (above $24.95) is made from superbly soft organic cotton velour and filled with natural corn fibres. Completely machine washable – which is fantastic – she’s bound to be very much loved! Buy yours at Sustainababy. Everyone needs a special friend and why not introduce the ever dashing Mr Maxiboy the Cheeky Monkey ($24.95) to the special cherub celebrating their first Christmas? 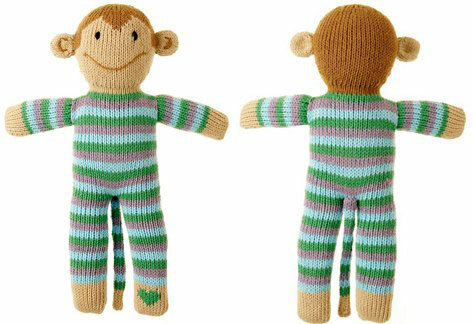 Knitted from pure cotton and standing thirty centimetres tall, his delightful aqua, green and purple jumpsuit and long tail is set to delight! Available from Huglees. These gorgeous Wallaboo Soft Toy Animals ($24.95) are new to Australia and made for cuddles – I’ve never seen a cuter mouse! They’re quite flat, with long tails and ears that make perfect handles for little ones to drag them around by. Made from quality cotton, these cute little guys get softer and softer with every wash. Wallaboo animals are available from Kiekaboo. This stunning Ruby Rose Children’s Bangle ticks all the boxes in the sentimental gift category. Made from solid sterling silver, this bangle can be personalised with the recipient’s name making it a truly special and sure to be treasured gift. Ruby Rose Children’s Bangle is priced $295 and available from Uberkate. Rattles are synonymous with babies so why not gift them an ultra hip one? 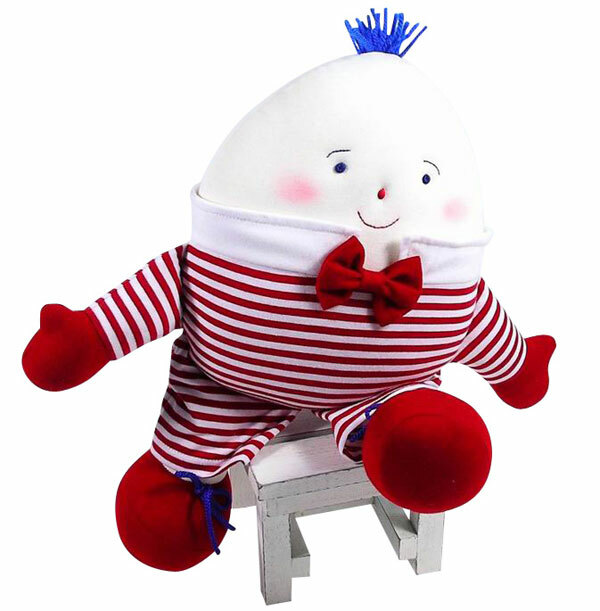 The Kate Finn Humpty Rattle is sure to have you all singing Humpty Dumpty on Christmas Day. Big enough to cuddle at thirty centimetres tall, this Humpty contains a pleasant jingle and certainly won’t break when he falls! Kate Finn Humpty Rattle is $45 and available from Monkey Caboose. 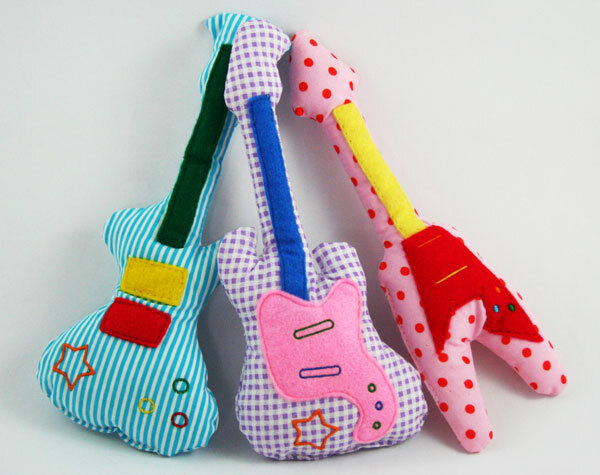 If your bub likes to rock out at nursery rhyme time, The Grateful Thread Rock Style Rattle ($14.95 each) might be more in tune with their inner musician. Available in blue, green or pink, these rattles are perfect for waving about at adoring fans. Get yours from A Little Bit Of Cheek. You can never go wrong with a practical gift and the Melobaby All In One Nappy Change Wallet + Change Mat ($64.95) is sure to be well received. Big enough to fit up to four nappies and a change of clothes, this compact wallet holds everything you need without the bulkiness of an overloaded bag, to make a perfect change station on the go . 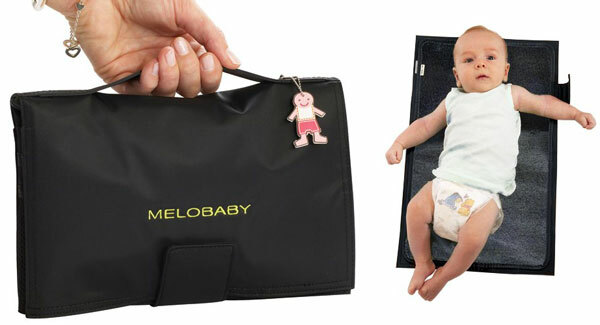 Available in black, brown, cream and red, the All In One Nappy Change Wallet + Change Mat is available from Melobaby. 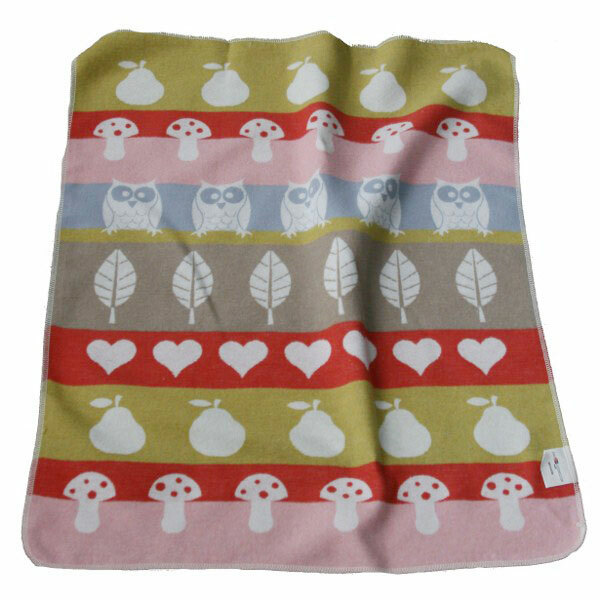 A beautiful blanket can be used all year round and we adore those from David Fussenegger. Stylish designs that set them above the rest, this will be one snuggly gift that won’t be given up easily. Cosy up with apples, pears, motor cars, owls and more in both bassinet and cot size blankets from $59.95 and available at Monkey Caboose. Give the gift of indulgence with a Just Hatched gift pack ($65.95) from Mambino Organics. This gift pack contains five luxurious organic products to help your baby be blissfully relaxed – Tippy Toes Calming Baby Oil, mild baby wash and Little Bottoms Diaper Balm to name a few. Just Hatched is luxury in a box available from Mambino Organics. Perfect for developing the senses are Wimmer Ferguson Mind-Shapes blocks by Manhattan Toy ($35.20). Each shape contains a noise maker and a combination of different fabrics and bold graphics to engage baby’s attention, keeping them busy! Available as a set of three, get yours at Classic Baby. Busy minds and busy hands need something to keep them entertained and I love the Hexi Twist Rattle. Beautifully coloured using non toxic water-based paints and made from rubberwood, it’s perfectly safe for your baby to play with. 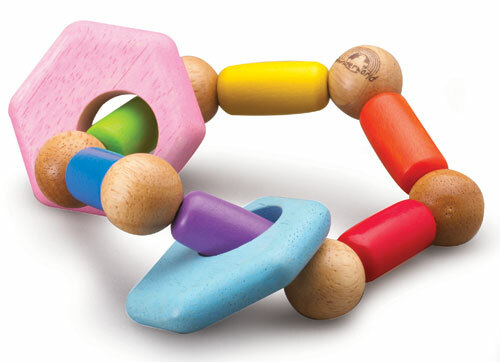 Not only does it look great, it twists, rotates and rattles – what fantastic fun! Available at Eco Toys for $19.50. Last but by no means least is this stunning Mother and Baby Owl Framed Print. 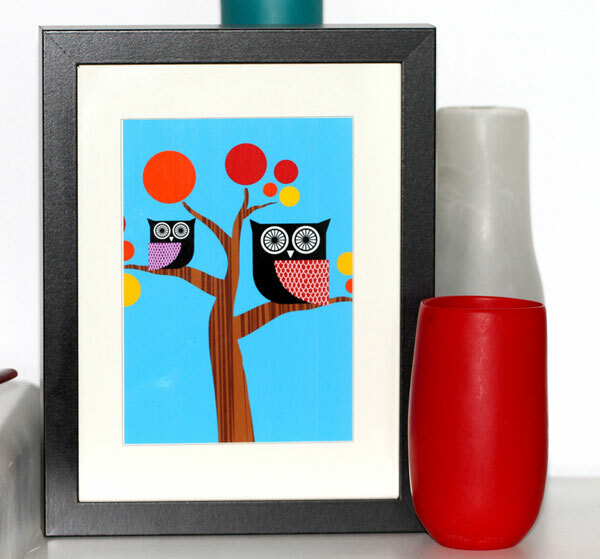 This print will pass the test of time and be hung in a favourite spot for many years to come, with its pair of whimsical owls, superb wood grain tree and use of bright colours. Priced at $45, it comes ready to hang upon unwrapping, so be quick to get yours from Scoops Design. We hope this Christmas Gift Guide for newborns helps you decide what to buy for the newest baby in your nest – may their first Christmas be a memorable one! Make sure you check out our gift guides for other age groups and categories – it’s gift-selecting made easy!